Researchers at Princeton University have discovered a new form of gallium(II) selenide (GeSe) that has surprisingly escaped detection until now. This so-called beta-GeSe compound has a ring-type structure like graphene and its monolayer form could have similarly valuable properties for electronic applications, according to the study published in the Journal of the American Chemical Society. Graphene has been hailed as a two-dimensional wonder material for electronics, but its lack of a semiconducting band gap has hindered its development. As such, a closely-related material, black phosphorus, has been receiving intense research attention. Not only does black phosphorus have a small band gap and a high charge carrier mobility, but it can easily be reduced to nanometer thicknesses. The researchers calculated that GeSe is highly analogous to black phosphorus and can be considered a pseudo-group-V element. 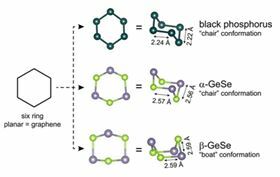 Under extreme pressure, black phosphorus is transformed into a simple cubic form, and the team wondered if the same could be done with GeSe. They heated the abundant alpha-GeSe form of the compound to 1200°C under 6GPa of pressure, or 60,000 times atmospheric pressure. "What we found was not only a new kind of GeSe – which is already unconventional by itself in that you rarely find new binary compounds anymore – but that it has this uncommon 'boat' conformation that we were amazed by," said first author of the study Fabian von Rohr, a postdoctoral researcher in the laboratory of chemistry professor Robert Cava. The rare ‘boat’ form of beta-GeSe is likely stabilized by the slightly smaller distances between its layers, while black phosphorus and alpha-GeSe exist in standard ‘chair’ conformations. This difference in structures gives rise to the compounds' different electronic properties. The researchers found that beta-GeSe possesses a band gap in between that of black phosphorus and alpha-GeSe, which could prove promising for future applications. Another advantage that GeSe has over black phosphorus as a material for electronics is that GeSE is robust under ambient conditions while black phosphorus is reactive to both air and water. This image shows the chemical building blocks of graphene, black phosphorus, alpha-GeSe, and beta-GeSe. Image: Cava lab.